Explosive Sports Performance (EXSP) exists to help you enhance and improve the greatest machine known to man, “the human body”. It’s the one machine that you will use every day of your life. And in order to help keep it running efficiently and keep it healthy, we need to understand how to maintain this incredible gift. EXSP helps our clients of all ages understand the importance of how the body works, how to improve it and how to transform it into the most dominate force on the planet. Let us teach you what you can do to help enhance your body each and every day. 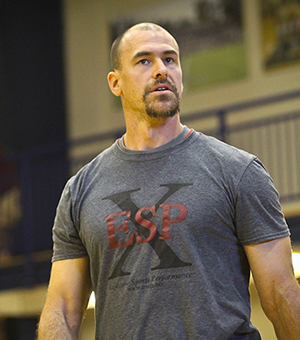 EXSP was started in 2002 with the goal of helping our clients achieve athletic success. Our main focus has been helping athletes unleash their potential through speed, strength, power, mobility and stability training. Helping numerous athletes reach success at the college and professional level, EXSP expanded to its current location in 2004. The main motivation of training with EXSP is for our athletes (clients) to understand their own body and how to break through all obstacles they are presented with. With our expanded location, EXSP can service more clients/teams with an outside turf field, indoor turf running area and many other tools needed to help our clients unleash their potential. One of the major differences with EXSP over other facilities is that EXSP uses very few machines. We instead focus the training to mimic the environment experienced in your respective sport or activity. 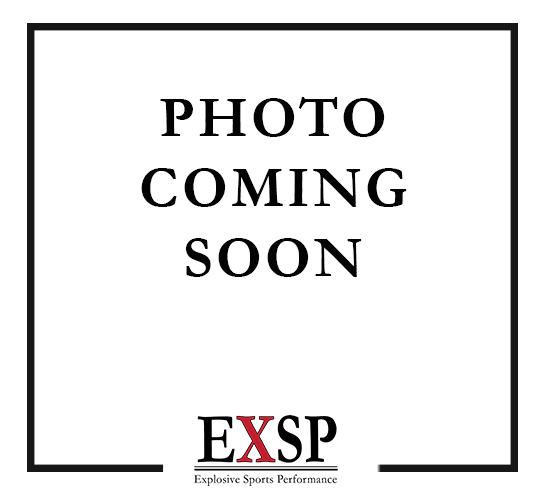 EXSP continues to help hundreds of athletes unleash their potential on and off the field which will always be a major point of emphasis for every program developed. Dave Brixius, the owner of Explosive Sports Performance, is a graduate of Bishop McDevitt High in Harrisburg, PA. Dave holds a Bachelor of Science degree in Health and Physical Education with a concentration in strength and conditioning. He is also certified by the National Strength and Conditioning Association as a Strength and Conditioning Specialist (CSCS). Dave specializes in designing and implementing individual and team work out programs focusing on explosion, speed, strength, power, endurance and injury prevention. In addition to helping athletes improve their physical skills, he also works on the mental side of training to help athletes improve their mental toughness and work towards the goal of becoming the best individual they can be on and off the competition field. Dave has served as the trainer for the Harrisburg Heat and the Harrisburg City Islanders helping them win the USL-2 championship in 2007 and runner-ups in 2011 & 2014. Dave also trains the Messiah men and women soccer teams, helping the men win the National title 2008, 09, 10, 12, 13 and women 2008, 09, 11, 12. 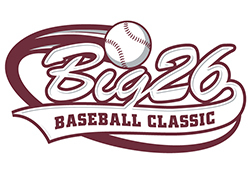 Dave also serves as the Big 33 (football) and Big 26 (baseball) speed consultant. Dave has also helped numerous other individuals reach the professional ranks in their sport, as well as many others receiving full athletic scholarships to college. From the moment you sign up at Explosive Sports Performance, you not only become a member of the gym but you become a member of the EXSP family. Dave’s passion in helping athletes and teams become unstoppable, and his solid foundation of how the human body works, will have your athletic abilities skyrocket to the next level. Dave’s rare and exclusive style of training will push you past your limits and leave you craving for more. One of Dave’s many strengths lie in helping athletes overcome pain and injury as fast as possible. He focuses his attention on three main things to keep the body healthy and strong. Mobility, stability and being symmetrical are keys to all athletes being able to reach their full potential. He also has a passion for combine training in football and baseball. Helping athletes improve their 40 and 60 time, shuttle run, broad jump, med ball toss. 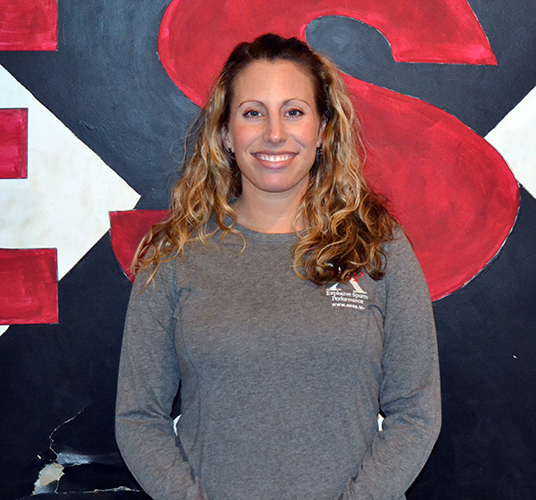 Ashley Brixius, the Executive Director of Female Sports Training and Conditioning, is certified through the American Council on Exercise (ACE), has a degree in fitness and nutrition, and is a licensed physical therapist assistant with an extensive background in sports rehabilitation and injury prevention. She is also a certified BootyBarre instructor as well as Pilates instructor. Ashley has been teaching group fitness classes and providing personal training services since 2003. Ashley’s charismatic personality and positive attitude will help make you feel comfortable from the moment you walk in the doors. She will customize a program suited to fit your needs. The wide variety of classes, personal training, small group training and home exercise programs offered through EXSP will ensure you meet your fitness goals. Ashley is passionate about “out of the box” training, utilizing new and innovative new ways to exercise. She travels to conferences all over the country several times each year to keep her workouts fresh and exercises cutting edge. Her goal is to transform your body and mind while creating a fun yet challenging workout that will leave you invigorated and excited to come back for more. Coach Alex graduated from Cumberland Valley High School where she played water polo, then went on to Susquehanna University to swim competitively at the collegiate level. She earned 4 school records while swimming at Susquehanna. She graduated in 2015 with a B.A. in Graphic Design and is now back in school at University of Pittsburgh studying Orientation and Mobility for the Blind. She coaches the Mechanicsburg High School men’s and women’s water polo teams and the Mechanicsburg Swim Club. She also works as an Assistive Technology Specialist for people with disabilities. Dan is a graduate of Trinity High School and a graduate of Mount Aloysius College with a Bachelor of Science Degree in Biology. As a former college baseball player (Pitcher), Dan understands what it takes to play sports at the college level and what it takes to train with the best at EXSP, being a former athlete who trained under Coach Brix. On top of working with athletes and various teams, Dan runs strength and speed workouts at the Pennsylvania Baseball Network (PBN) training facility. He is currently working towards his certification as a Certified Strength and Conditioning Specialist. Dan has been a member of Explosive Sports Performance since 2012 as an athlete and has been an employee since 2016. With a passion towards training baseball players, he wants to bring the same energy into his workouts that he had when he played. 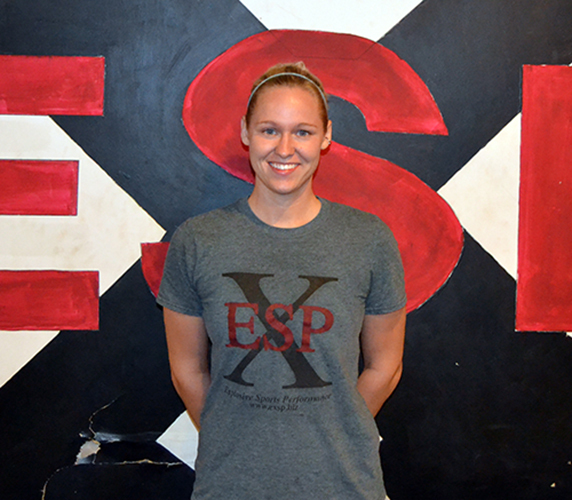 Bringing our athletes’ game to the next level while training at EXSP is what Dan strives for. Heather Sorber is a graduate of Penn State University with a Bachelor of Science degree in Kinesiology. As a former athlete she knows the demands that athletics place on the body. With her knowledge of how the human body works she is able to develop and design customized programs for each individual. Heather is certified through the National Strength and Conditioning Association as a Strength and Conditioning Specialist. Heather has been a member of the Explosive Sports Performance family since 2013, helping teams and individuals unleash their potential. She is passionate about training youth athletes because she believes that teaching kids proper form while they are young can help reduce the risk of injuries as they get older. Theresa Speziale graduated from Arcadia University with her Doctorate in Physical Therapy. She completed an orthopedic residency program and is a board certified Orthopedic Clinical Specialist and has her Direct Access License. She has worked with patients of all ages and abilities, including high school, college and professional athletes. Her approach favors movement analysis to identify dysfunctional movement patterns and correct them in order to restore alignment and relieve pain. Her goal is to restore pain free movement and get her patients back to the activities or sports they enjoy as quickly as possible. 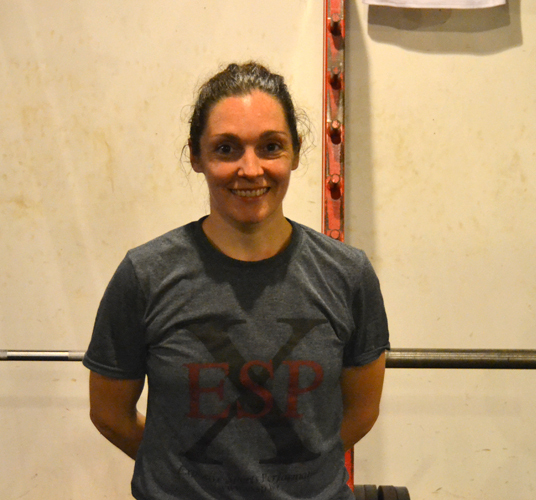 Theresa has been training at Explosive Sports Performance since 2012 and also competes in Wushu, a style of Kung Fu. She has won multiple awards and was ranked first in the nation in several events through the International Chinese Martial Arts Circuit over the past 2 years. As an athlete herself, Theresa understands the importance of body mechanics and injury prevention. She is passionate about teaching people how to achieve top performance in any activity by better understanding their own bodies and how to move without pain.